As a long time fan of the eVic VTC Mini series my first impression of the new eVic VTC 75W Starter Kit was, “oh, okay, another step in the evolution of the eVic-Mini. No big deal.” However, this 75W eVic Mini is a lot more than a simple wattage hike. This time out, there is an improved TC system and a brand new tank, the Tron. (like the movie). Coming in at the same size and shape as others in the eVic VTC series, the new 75W model comes in a new gold and a new red color finish, among others. In addition, Joyetech has developed a matching tank that not only works perfectly well with the device, it too features a few new tricks, such as no visual airflow. We’ll discuss more about this new Tron tanks below. 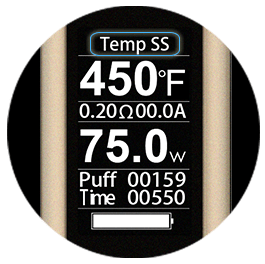 Once again the eVic VTC 75W features the high resolution, but this time it is an upgraded display, now sporting 7 lines of horizontally displayed information that, in my opinion, sets the standard as the finest display on any vaping device so far. Using the eVic VTC and Tron tank is a very simple, straight up affair that will definitely appeal to new vapers and advanced vapers looking for simple pleasures of temperature control vaping with power to spare. Line 1: Temp Mode: Temp Ni, Temp Ti, Temp SS, Power mode and Bypass mode. Line 2: Wattage or temperature. Line 3: Resistance (ohms) and current (amperage). Line 4: Output power (W) or output voltage (V). Line 6: Puff Counter display. Line 7: Battery Charge remaining. When vaping, the wattage will ramp up to the maximum temp almost instantly, and the eVic-VTC can sustain itself at this high temperature with a much lower wattage setting. The Variable Temperature setting allows the users to vape with Nickel, Titanium or Kanthal Wire before the firmware upgrade. After the firmware upgrade Stainless Steel coils can be used in the Tron tank to support VT-SS mode. These new SS coils are said to bring out a different flavor experience with each change of the temperature setting. When used in other modes, such as variable voltage or bypass mode, improvements to the taste, as well as longer battery life are also said to be among the benefits of this new SS coil. I have not yet had the opportunity to try this device and tank with SS coil heads, so I can’t say that these new benefits are noticeable, or slight. Output wattage can be adjusted from 1W to 75W, in .1w increments. In the new Bypass mode, the device has the ability to become a direct output mode for voltage. The resistance must be in the range of 0.10-3.5 ohm in order to fire in Bypass mode. unique, triangular shaped glass window where you can see how much e-Liquid you have left. The Tron-S also has a “hidden” airflow control design which is both elegant and subtle. It is also highly effective, more so than I expected. The Tron-S features has silicone ring that comes in several colors which can be used to personalize the tank beyond just the base color. There is also a Tron-T tank that features a top down circular window at the top of the tank, with no window on the sides. I don’t know whose idea it was to design a tank like this, but it is impossible to see the eliquid level looking down into the tank. I received one of each tank, and quickly discarded the Tron-T in favor of the Tron-S. I asked several other vapers if they could detect the eliquid level looking down through the Tron-T top window and no one could. I just don’t understand the reason for this tank. The Tron-S and Tron-T are compatible with eGo One Atomizer Coil Heads such as the CL, CLR, CL-Ni (Nickel), and the CL-Ti (Titanium). 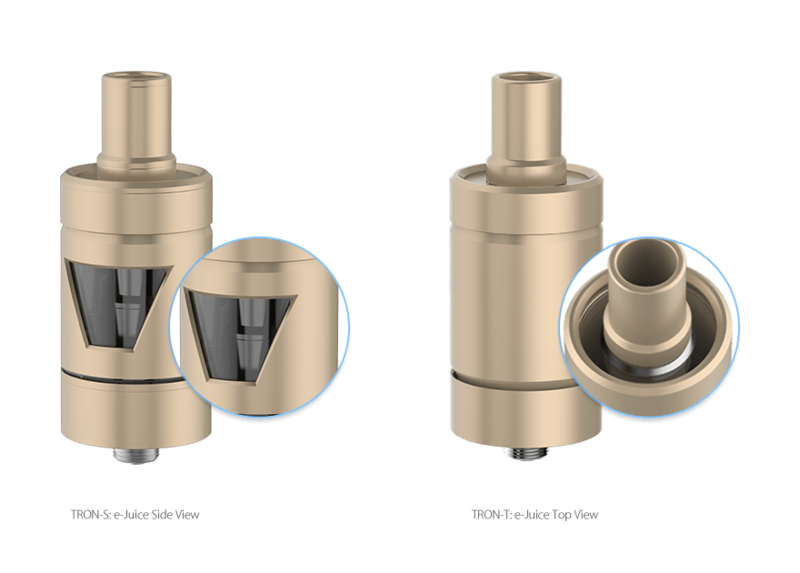 The Tron tanks fill from the bottom; simply unscrew the base and fill the tank while avoiding the airflow tube in the center. Screw the base back on, attach to the eVic-VTC and vape away. Remember, as always, drop a little juice into the fresh coil to saturate the coil and cotton. Like all the other eVic VTC Mini’s I’ve used in the past, the new 75W Plus Tron tank is a joy to use. And that’s understandable since this new 75W eVic-VTC is the same hardware of the previous eVic-VTC. The changes occur via Firmware updates, one to bump the 60W model to 75W and one upgrade for the new V2 Display. New colors are pretty much the physical changes to the eVic-VTC. As with the previous model the 75W Plus Tron uses a stainless steel 510 thread and spring connector for secure connections of the tanks you’ll use with it. 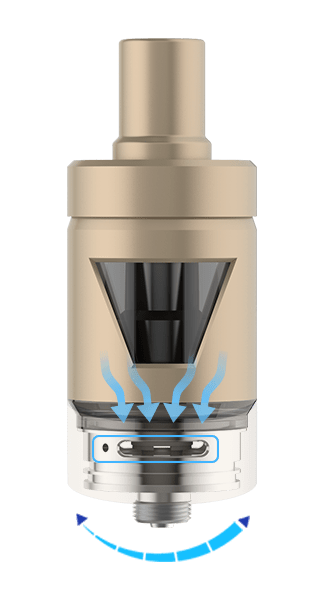 The Tron-S tank works every bit as well as the eGo Mega Tank that comes with earlier eVic-VTC’s, but provides a better solution for keeping an eye on the eliquid level, and a better drip tip. The improvements of the Tron-S over the eGo ONE Mega tank seem to be aesthetics more than anything else, since the same coil heads are shared among the eVic-VTC’s and eGo ONE devices. That said, I certainly like the Tron-S Tank on the eVic-VTC better than the eGo One Mega tank. Of course, you’re not limited to the Tron tank, you can use whatever tank you wish, just as long as the coil heads in the tanks are in ohms’ range of the eVic-VTC. I often used a Subtank with the 0.3-ohm and 0.5-ohm OCC with my eVic-VTC’s, as well as others. For under $60, this Starter Kit, which includes the eVic-VTC and the Tron-S tank, works out to be a very good value. Battery life, while in any mode, is fine. I always recommend the Sony VTC4, a 2100mAh battery cell that outputs a steady max-discharge of 30A. Every eVic-VTC Mini shines with this particular battery. The Sony VTC4 takes about 3 hours to fully charge via a USB cable. I rarely use the USB cable for recharging any battery for any device. I prefer removing the batteries whenever possible and using a Nitecore battery charger, most often the Nitecore i4, an intelligent charger capable of charging up to 4 cells independently. coil heads, the 1.0-ohm (Kanthal) is preinstalled in the tank. Usually the 1-ohm is used for mouth to lung vaping, and it is here as well. However, with the airflow of the Tron-S set to its widest opening I was able to get to a tight lung hit, which I found worked fairly well, but I prefer a lower resistance coil and lung hit vaping, so it didn’t take much to switch out the preinstalled coil head and vape with the Nickel and Titanium coil heads. Temperature Control was first developed by Evolv with their DNA40 board. Nickel was, at the time of the DNA40 introduction, the only metal used for temperature sensing because the resistance of nickel increases in proportion to the increases in temperature. When the temperature rises the resistance increases by an anticipated amount. All other metals that have been used with temperature control, or sensing, are successful only because newer technologies adapt to the different coefficients of these metals. For more on how these coils work, I suggest our primer on temperature control. 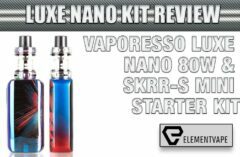 The Starter Kit includes a 0.2-ohm Nickel and a 0.4-ohm Titanium coil head. These coils are fantastic lung hit coils, and although they can certainly be used in Variable Wattage mode, I suggest using the modes they were designed for, the temperature control modes yield the best results. 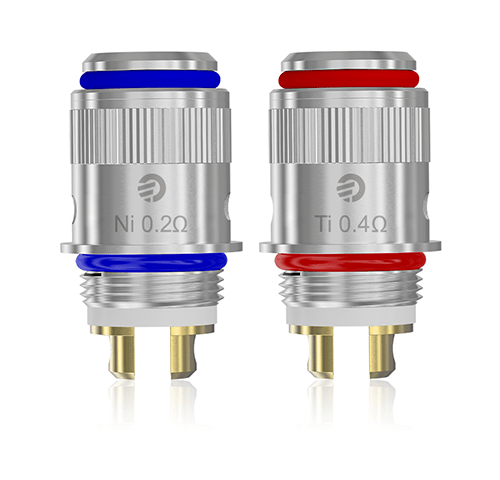 Some say the Ni200 or Ti coil heads don’t last as long when used in VW mode, but if that is true the shortened life span is minimal at best. The 0.2-ohm Nickel coils have a low resistance to electricity, so the coil needs a few more wraps to bring it into line with the mod’s ability. But, the extra work that goes into providing a Nickel coil for the Joyetech TC-equipped mods are worth it. Nickel coils provide a rich, clean flavor and super dense vapor. Vaping with the 0.2-ohm Nickel coil head will provide you with a delicious and warm vape. Titanium coils have their fans as well, and I know more than a few vapers that enjoy the slightly higher resistance of the Joyetech Ti coil heads, but I find that they provide a very slight metallic taste to high VG eliquid. The Stainless Steel coils are the newest coils to adapt to temperature sensing. I’ve not used this metal in a Joyetech coil, so I will update this review when I have. 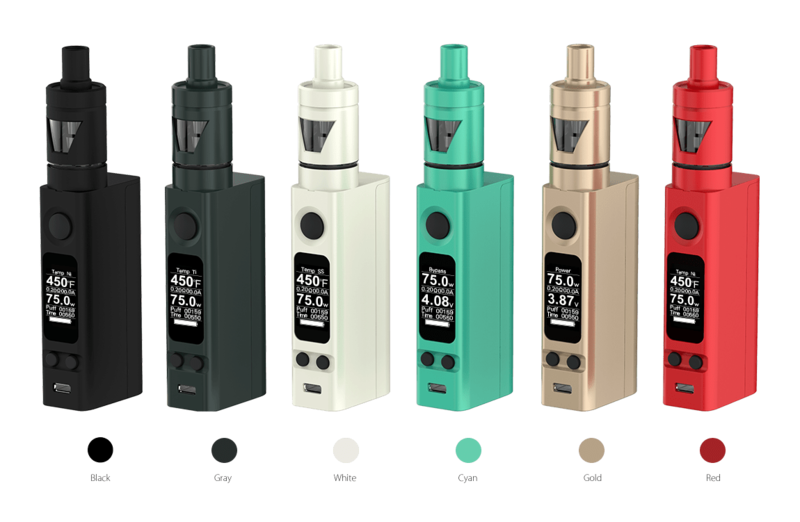 If you already own the eVic VTC 60W the firmware updates will get you to 75W and the new version of the display so I see no need to upgrade unless you want one of the new colors, or it’s time to replace your 60W. 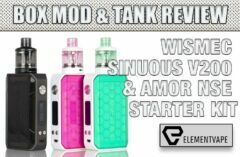 The Tron tank is available as a standalone tank for $17.95 (MyVaporStore), and it works just fine with any eVic-VTC, or other devices. 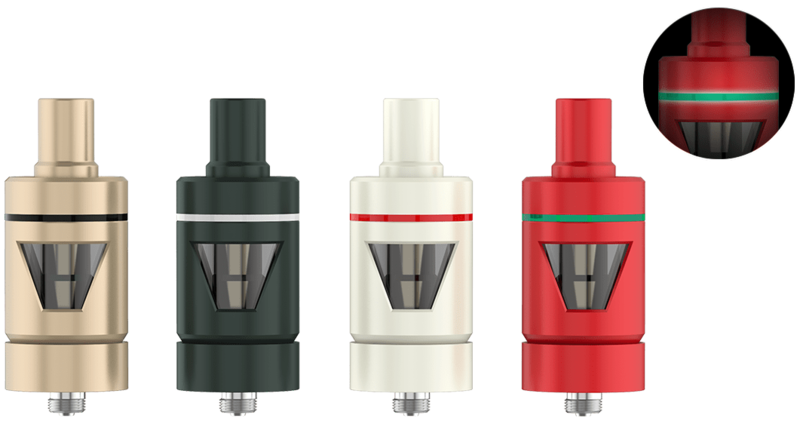 The new eVic VTC Plus Tron Tank Starter Kit offers a couple of new colors, Gold and Red, plus Cyan, Grey, Black, and White. The separate purchased tanks come in these colors as well, so you can mix and match if that’s what you want. I was a little disappointed that the Joyetech Mustard Yellow wasn’t a success, I would have loved an eVic-VCT Mini and Tron in that color. I haven’t seen the Red eVic-VTC/Tron, but I am hoping that, unlike the new eGrip (review coming) that its actually Red, not hot pink. I have hope though, since the Gold color is a nice rich shade of Gold. One can hope. If you’ve been waiting for the right time to buy an eVic VTC this is an excellent time. The price is as affordable as ever, and the bang for the buck is biggest yet. When the eVic-VTC Mini was introduced with the eGo ONE Mega tank it just didn’t sit well with me. It wasn’t the performance, it just felt forced, as though Joyetech knew they had to offer a starter kit that included a tank, so they decided to use the eGo ONE Mega. Now, with the Tron tanks, the eVic-VTC Mini feels complete. Lastly, despite its advanced features and tons of options, the eVic-VTC has always been user friendly. I would not hesitate to give one to a new vaper, or any vaper looking to dive into temperature control, or other metal coils, like Titanium and Stainless Steel. Each new model in the eVic-VTC series gets better and better, without moving up in price. I have no doubt we’ll soon see an eVic VTC at 100w and larger Tron-S tank (I think the Tron-T will go extinct soon), but part of the fun of vaping is to enjoy what’s out now, and the 75W Plus Tron tank kit is a lot of fun to use.